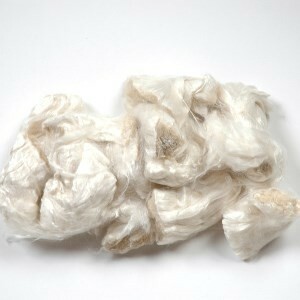 50g bags of pure mulberry silk tops cut into chunks for spinning and silk paper making. These are lustrous pure mulberry silk tops, in a lovely bright white colour which have been cut into approx 3" (7-8cm) chunks. 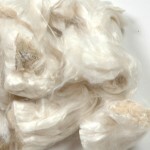 The fibre is gorgeous and gleaming having been de-gummed and combed to produce a unique lustre and soft handle. These shorter pieces of fibre were originally created to be spun into textured yarn, which means they are nice and easy to handle for your chosen craft. Silk tops can be spun into a strong, glistening, sleek white yarn that can be knitted or woven into luxurious garments, or blend with other fibres to make the silk (and your budget) go further. These long, smooth silk fibres cannot be felted as they are, but will add a glorious lustre to felt when carded with other fibres (such as merino wool) and are perfect for needlefelting. Use within silk papermaking by combining with cocoon strippings or throwster's waste or use on their own, but with a glue medium, to create a fabulous 'paper' fabric with many possibilities as a background to work on. These gorgeous white fibres will dye easily with hot water dyes (into bright, fresh shades), whether before transforming them into something else of afterwards - and will retain their lustre. Handy chunks of silk are nice and easy to use and at a great price without losing any quality.